If you prefer a destination instead of an air trail or air tour… Lake Eufaula, formerly known as Fountainhead State Park, in Oklahoma may be a good option for you. Situated between Fort Smith, AR to the east, Tulsa, OK to the north, Oklahoma City, OK to the west, and Dallas, TX to the southwest, Lake Eufaula is a reservoir on the Canadian River, 27 miles upstream from its confluence with the Arkansas River. It is the largest-capacity lake in the state of Oklahoma with a volume of 2,099,000 acre feet, a surface area of 102,000 acres, and 600 miles of shoreline. Carlton Landing Field (91F), owned by Oklahoma Tourism and Recreation, while charted, is indefinitely closed according to the Chart Supplement (formerly the Airport Facility Directory or A/FD). Eufaula Municipal Airport (F08) and Fountainhead Lodge Airpark (0F7) may be unattended but they both have 3,000 foot runways. I would recommend you call them before landing for a condition update. And keep in mind that neither airport has fuel. The Fountainhead Creek Golf Course is next to 0F7 and the Lake Eufaula Marina is not too far either. They offer boat rentals, have a fish store, sell pizza, etc. If those runways are not long enough, McAlester Regional Airport (KMLC) or Henryetta Municipal Airport (F10) are not too far but you would need a rental car to get to the lake from either airport. RV and tent camping can be found all around the park, some with beautiful lake views. But, don’t want to “rough it” camping? How about glamping? There’s no tent to pitch, no sleeping bag to unroll, no air mattress to pump, and no fire to build to cook. And what if I tell you it could be in a yurt? Yep! Fun! Lake Eufaula State Park has a campground (or glampground) that rents three yurts for overnight guests looking to camp without the hassle of leaky tents, bulky camping gear and dirty conditions. 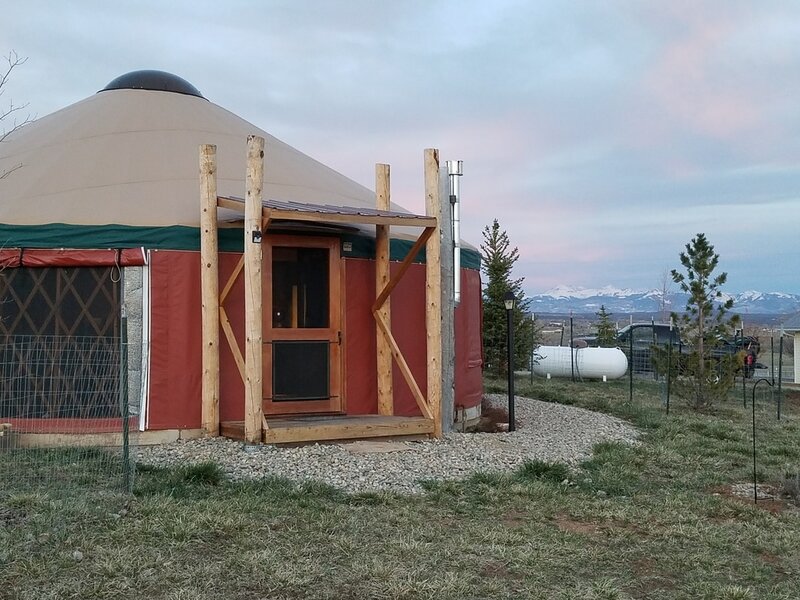 Every yurt comes equipped with heating/air conditioning, all bedding, a microwave, mini fridge, electricity and television. There is no running water inside the yurts but the restrooms are located close by. Our yurt experience, as an example, in Cortez, CO.
Lake Eufaula, the largest lake in Oklahoma, offers a wide variety of activities to make your camping trip enjoyable. Boat rentals, marinas, fishing, boat ramps, nature center, ATV riding trails, hunting, hiking and biking are just a few of Eufaula's amenities and activities. Lake Eufaula State Park has many outdoor activities for you to enjoy during your flying excursion. You can do one (or more) of the many hiking trails, cast a line in the lake or Kid's Fish Out Pond, visit the Nature Center, go swimming in the lake or enjoy the sandy beach area, rent a boat at the local marina, go horseback riding, or just sit back and relax and enjoy the shores of the lake. For more information or to visit a camping site, visit http://www.stateparks.com/lake_eufaula_state_park_in_oklahoma.html or http://www.travelok.com/listings/view.profile/id.4336?CMP=facebook. Life is short! Fly safe and fly often! ​You may wonder… what is Oklahoma’s Adventure Road? Easy! 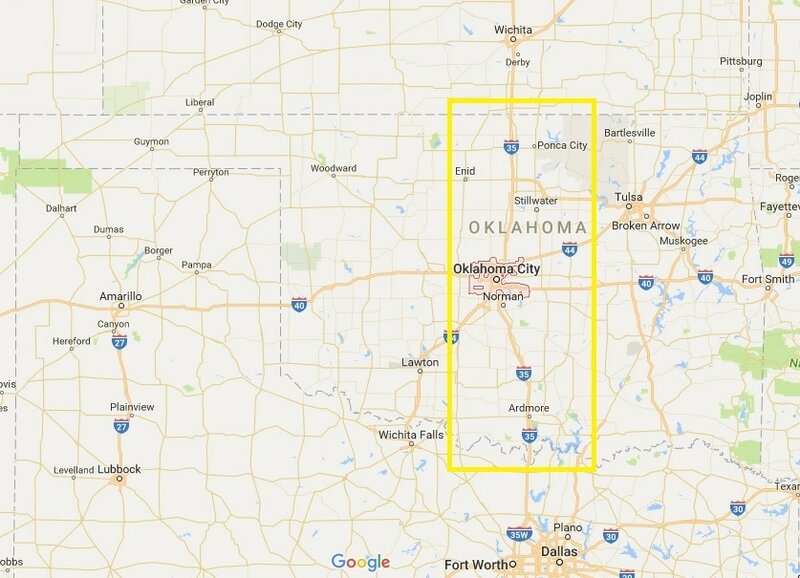 It’s Highway 35, cutting Oklahoma in half and connecting Oklahoma City with Dallas/Fort Worth to the South and Wichita to the North. The Google Maps map below depicts it. ​And it gets better… you can create your own adventure/trail if you do not necessarily want to follow any of the previously prepared adventures. 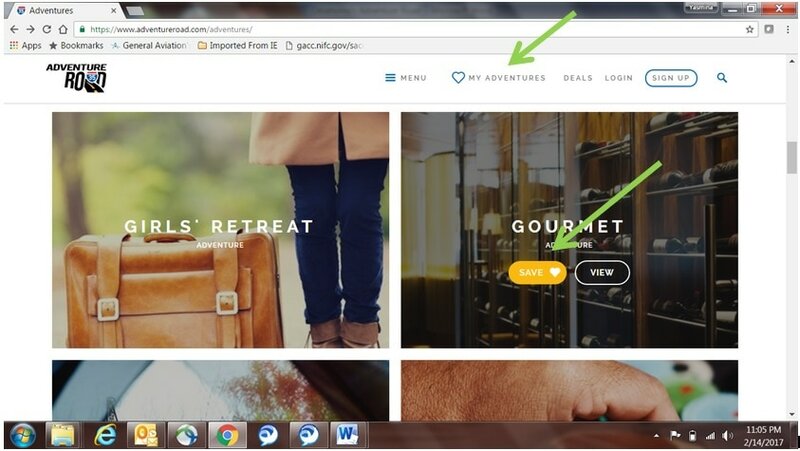 Click the heart to save anything to your My Adventures page and get ready to travel! The screenshot below shows both the “heart” and “My Adventures” functions. ​Soooooo this Adventure Road website is really designed for hitting the roads. But we fly. Therefore, after you have selected an adventure you want to experience or defined your own adventure, take a look at a sectional to find the most suitable airports to fly into. Let’s start with this popular stop. Why? Well, because “the hottest jalapeño on the runway” has been at the Ponca City Regional Airport (KPNC) for over 30 years - Enrique’s Mexican Restaurant that is! They are open for lunch and dinner every day except for Sundays. The Oklahoma Tourism and Recreation Department website says that Perry was born of the 1893 land run which opened the Cherokee Strip for settlement. They suggest learning about the land run at the Cherokee Strip Museum. The Perry Municipal Airport (F22) is your gateway airport. If you don't mind a 25NM detour, the Enid Woodring Regional Airport (KWDG) houses the Barnstormer's Restaurant with great windows facing the ramp. It is open Monday - Friday, 8 am to 2 pm, except for the 4th Saturday of the month when there is a monthly fly-in. Locals claim Stillwater is America’s Friendliest College Town. You should decide that on your own. In addition, they are also known for the Red Dirt Film Fest, an independent film festival, and the Land Run 100, a 100 and 50-mile long bicycling endurance challenge on gravel and dirt roads. The Stillwater Regional Airport (KSWO) is a Class D airport. Visiting an aircraft manufacturing company is always very interesting. It is still a very handcrafted industry. Zivko Aeronautics, Inc., builder of the Edge 540 aircraft among other things, is based at the Guthrie-Edmond Regional Airport (KGOK). Who doesn’t like a fun and capable 540? I know Red Bull Air Race pilots do. That’s what most of them fly and they’re made in small town USA. Let me tell you a little secret. My husband and I love drive-in theaters. The Beacon Drive-In Theater actually allows us pilots to fly-in and walk over. How cool! They haven’t figured out how to get our aircraft to taxi over there yet but, hey, maybe that’s next :) They’re not too far from it. You can see it in the aerial below. Keep in mind they are not open year around so check their calendar first. The Wiley Post Airport (KPWA) has a restaurant in the terminal building, under the control tower, called Annie Okie's Runway Café that may be closed on Mondays but opened for breakfast and lunch otherwise. The Sundance Airport (KHSD), while obviously not related to the Sundance Film Festival, has always been a very friendly airport during my travels and self-serve avgas is always an easy and cheaper option there. I’ll let you discover that their crew courtesy cars are a nice touch, too, unless you’re one of those that enjoys taking selfies with old beat up police cars as crew cars ;) Do take a look at the sectional closely before operating in and out of KHSD as KPWA’s Class D airspace isn’t too far to the south. The Will Rogers World Airport (KOKC) is also available if you want some more Class C experience and don’t mind mixing with airliners. The Clarence E. Page Municipal Airport (KRCE) may be the furthest airport from town but still a good possibility. Once on the ground, there are at least two museums in town that have aviation ties, the History Center and the 45th Infantry Division Museum. Oklahoma City is the Capitol of Oklahoma so you can always tour the Capitol building. The events of April 19, 1995 dramatically changed Oklahoma City forever. The Oklahoma City National Memorial & Museum is a good memorial in their honor. Stockyards City lets you experience western heritage. You can enjoy shopping for a new pair of boots, take in some country music, witness a live cattle auction, or take in a meal at Cattlemen’s Steakhouse. If you’re looking for entertainment, then there's no better place than Bricktown. This former warehouse district includes the Chickasaw Bricktown Ballpark, a mile-long canal with water taxis and lots of restaurants and clubs. Automobile Alley, listed on the National Register of Historic Neighborhoods, and midtown follow Bricktown as far as entertainment, shops, and restaurant options. If you visit OKC on the second Friday of any month, you can enjoy “Live on the Plaza” from 6 to 10 pm, a block party featuring live music, featured artists, special events and local shopping. The Adventure Road website I mentioned earlier has a dedicated adventure for Oklahoma City. The Oklahoma City Convention & Visitors Bureau also has a website with more things to do and see. Do you have a kid/grandkid/friend interested in universities with aviation programs? If so, you’re in luck! The University of Oklahoma offers good aviation degrees (aviation management, non-flying aviation management, and air traffic management) and professional flight training and they are based at the University of Oklahoma Westheimer Airport (KOUN). In fact, as the name says, KOUN is owned and run by the University. Food is always a good attractant for pilots. Here is another opportunity. Ozzie's Diner is in the terminal building of the Airport and offers good views of it. Ozzie’s serves daily from 6 am to 9 pm, except on Sundays when they close at 3 pm. With the new headquarters in Norman, Commander Aircraft Corporation will keep the existing fleets: maintaining, in service, and flying. And Commander says they are ready to be reborn with a new model, design, and features. Maybe it’s time for a visit. 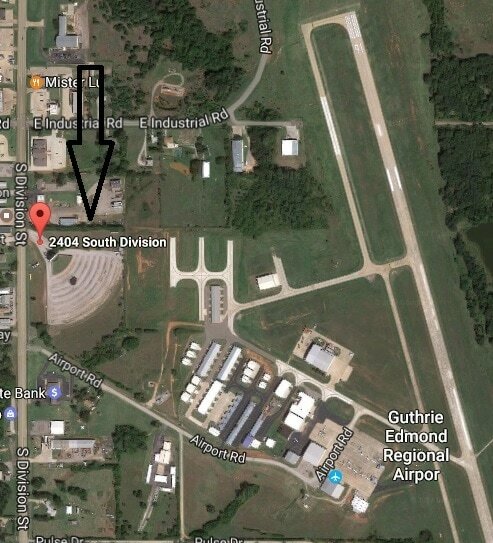 The Pauls Valley Municipal Airport (KPVJ) is now a one 5,000 foot runway airport. Don’t let the sectional fool you. Jake’s Joint restaurant is open for lunch, Monday through Friday, at the Ardmore Municipal Airport (KADM). Jerry Allan King-Echevarria (JAKE) operates it and has operated an aircraft maintenance and customizing company on the Ardmore Airpark since 1993. If you are not intending to eat while in Ardmore, the Ardmore Downtown Executive Airport (1F0) may actually be a more convenient airport for you. It’s a smaller airport and closer to town. This website recommends the boutique shopping on charming Main Street, the modern art at Charles B. Goddard Center, or the Southwest Historical Museum and the adjacent Military Memorial Museum for local history. Lake Murray is a 5,700-acre lake very close to Ardmore but it has its own airport. We don’t have too many state parks with airports but the Lake Murray State Park Airport (1F1) is one of them! That’s quite a treat! However, keep in mind that 1F1 has 2,500 foot runway and it is mostly unattended. It’s also worth noting that this Airport has been targeted negatively by the media in recent years so we need to show them we use it just like some people did here. Lake Murray is the state's oldest and largest state park. While there, you can enjoy a round at the park's golf course or find many fossils and a 288-pound meteorite at the hard to miss Tucker Tower Nature Center. The structure looks like a lighthouse and served as a summer retreat for Governor Murray. And from one lake to another… the Lake Texoma State Park Airport (F31), owned by the U.S. Corps of Engineers, is the second state park airport this air trail highlights. It has a 3,000 foot runway with an out of service (indefinitely) airport beacon. Lake Texoma is Oklahoma's second largest lake and one of the premier striped bass hot spots in the southwest. Besides fishing and a myriad of watersports, Lake Texoma State Park offers swimming, camping, picnic areas, wildlife viewing opportunities and hiking. The park also features comfort stations with showers, boat ramps and a small hiking trail near the Two Rivers Nature Center. The privately operated Catfish Bay Marina located within the park offers a full service marina with a fuel dock and striper guide fishing services. A marina mart featuring a convenience store and gas station is also available on-site. And, now, you can add your touch to this aviation adventure or air trail by deciding which aviation and non-aviation stops you’re going to make. Fly safe and fly often! These air trails are a lot of fun!